This resource was co- created by volunteers from Malton Museum and a group of local Primary teachers. The digital resource is a free online resource and can be used in a variety of curriculum areas including History, Geography, Literacy, and Numeracy. This resource has been designed to be flexible, it includes a large amount of information so teachers can use sections as applicable to their needs and time frame. It is meant for pupils to use the resource for their own research and information gathering independently. Although it has been designed as a local study topic for the town of Malton, it can easily apply to other market towns. It can be used as a stand- alone teaching aid or used in conjunction with a resource box and/or costume chest. Click on the links below which will load the power-point presentation. The resource box contains a folder giving lots of suggestions for practical hands-on activities using the contents of the box. There are replica artefacts for handling and discussion, copies of old billheads and advertisements, pre- decimal coins and many old photographs to give a feel of the market town in the past. Many of the activities would link to a topic of the Victorians. 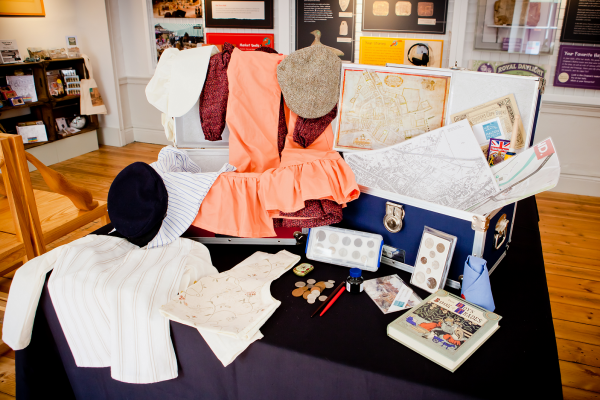 The costume chest contains both adult and children’s Victorian style costumes to encourage role play around many of the topics which can be developed from the information within the resource. The resource box can be borrowed for £10 for 2 weeks and £10 per additional week thereafter. The costume chest can be borrowed for £10 for 2 weeks and £10 per additional week thereafter. Please give name of the school and details of a key contact person. Please state which box you wish to borrow and possible dates. We will reply as soon as possible to confirm the booking and arrangements.